This fire season has change our county forever. Four large fires The Rocky Fire, The Elk Fire, Jerusalem Fire and last (and most destructive) The Valley Fire. The latter destroyed over 1300 homes, leaving so many of our friends and fellow citizens homeless. Fires in Lake County represented 52% of the firefighting in all of California. No doubt recovery will be slow and the focus of our communities energies for years to come. 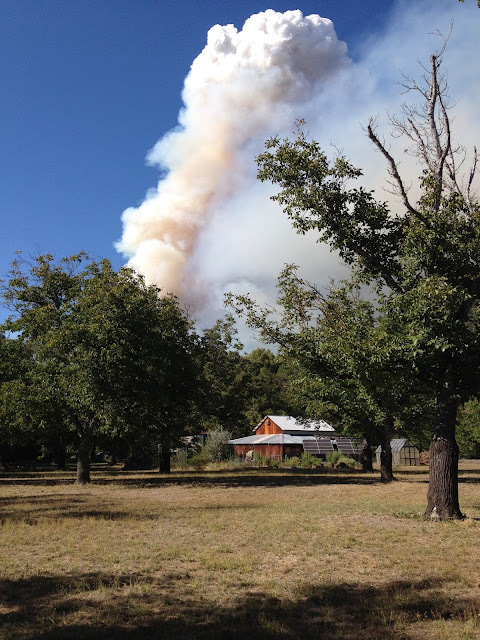 Thank you to everyone who has inquired about our farm... we are many miles from the Valley fire, and were downwind from the Elk fire, so all is well here at Dancing TreePeople Farm. We are formulating our response to the rebuilding that will take place in the fire areas and helping friends. This was the smallest fire in the scheme of things this season... but it shows a wildfire scale against the backdrop of human habitation. These truly are unstoppable once they get going, taking the landscape like a tsunami. "Something Good Will Come of This"
Sitting still helps me to see better. This was true when I sat in contemplative prayer for the people and needs of the city of Atlanta at Maisha (an urban house that I helped found in 1990). As I sat there in the quiet my eyes were opened to the struggles of the poor among whom I lived and my heart learned compassion from their example of caring for each other in times of desperate need. Something like what has happened in my present home, Lake County, as the recent devastation by wild fires has released an outpouring of generous assistance from so many sources. And it is true today. Sitting helps me see better. This morning as I sat in meditation I once again was gifted to see better. Deer pranced through the orchard, doves flew from their roost in our neighbor’s yard, a spider web glimmered in the sunlight, and the walnut tree leaves danced in the gentle wind. My inner sight saw clearly the rhythm of life that surrounds me and the lesson I am called to remember: Flow and be free. Though planning is important and tasks need to be done, what is essential is a profound trust in the goodness of life that frees one to be here and now at peace. My mantra for this day: Here and now flow and be free.